You can make homemade body scrub recipes to exfoliate your skin and leave it feeling smooth and refreshed. 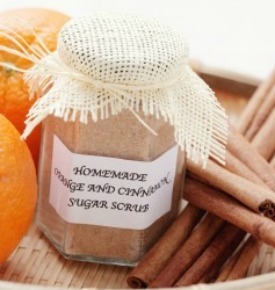 This article offers a variety of sugar and salt scrub recipes (and one coffee scrub). An exfoliant to mechanically remove dead skin cells. Four common exfoliants are salt, sugar, ground coffee, and oatmeal. Other possible exfoliants include almond meal, buckwheat, cornmeal, flax meal (linseeds), ground nut shells, rice bran, and wheat bran. A carrier oil, such as almond, coconut, grapeseed, jojoba, olive, sunflower, or walnut. Fragrance. A store-bought product might contain artificial fragrance, but what you want is genuine essential oils. In general, don't use scrubs on broken or sensitive skin or on your legs right after you shave them. Use the scrub in the shower or standing in the tub. Use the scrub on clean, damp skin. Apply scrub gently in circular motions, moving from the extremities towards the center of your body. Rinse off the scrub with warm water. Caution: Shower floor will become slippery. Moisturize your skin, if needed. Some of these body scrub recipes are already moisturizing. Click here for foot scrub recipes. Gently stir together the salt, shampoo, and jojoba oil in a small bowl. Pour the scrub into the jar. Store in a cool, dry place. Combine the warmed oil with the essential oils. Mix oils into dry ingredients. Mix the salt, coffee, cinnamon, and essential oils in a glass bowl. Add carrier oil slowly, stirring continuously, until the consistency of the mixture is like moist sand (you may not use all the carrier oil or may need slightly more). Blend all ingredients and use immediately. Put the ingredients in a glass jar and stir well. If needed, adjust the amount of carrier oil or sugar to get the consistency you want. To use, gently rub a small amount on your skin. Use warm water to rinse well. Place sugar in a bowl. Add essential oils and stir until oils are well combined with sugar. Stir olive oil into the coconut oil. Slowly add the oil to the sugar mixture, stirring constantly until well blended. Carefully put the scrub in a glass container of your choice. Adapted from Amy Loves It. Caution: Orange makes your skin more sensitive to the sun for 12 to 48 hours after use. Mix all ingredients together in a bowl. You can adjust the amount of oil to create a consistency you like.